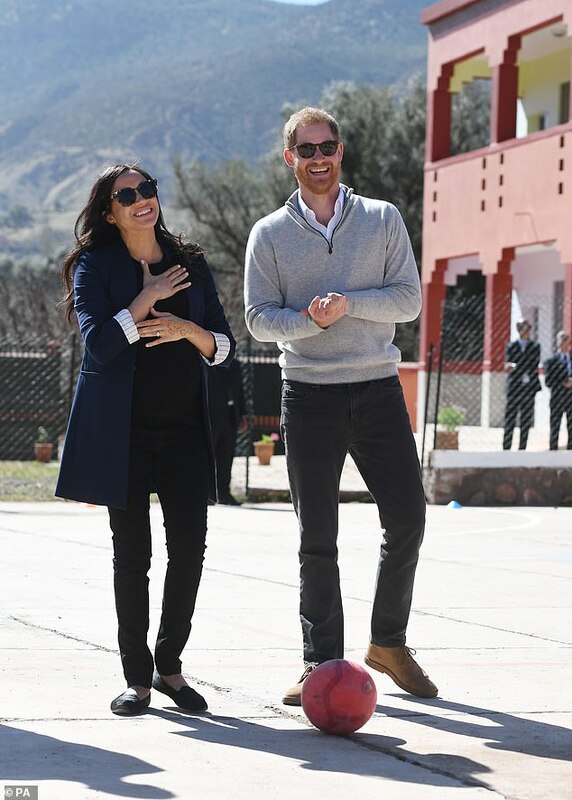 The Duke and Duchess of Sussex enjoyed a successful three-day tour of Morocco following pregnant Meghan’s luxury baby shower in New York. 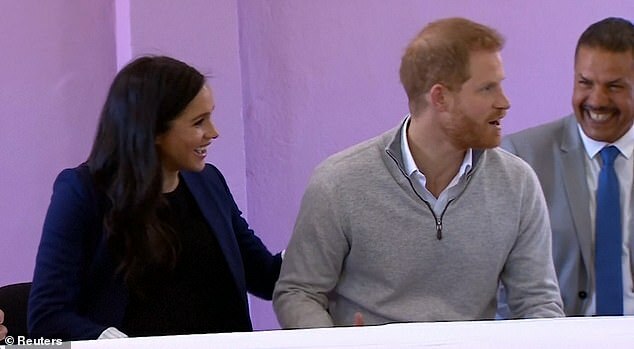 And Prince Harry, 34, couldn’t help but show his cheeky side during day two of their official visit as he jokingly pretended he was unaware that his wife – who is due at the end of April – is expecting. 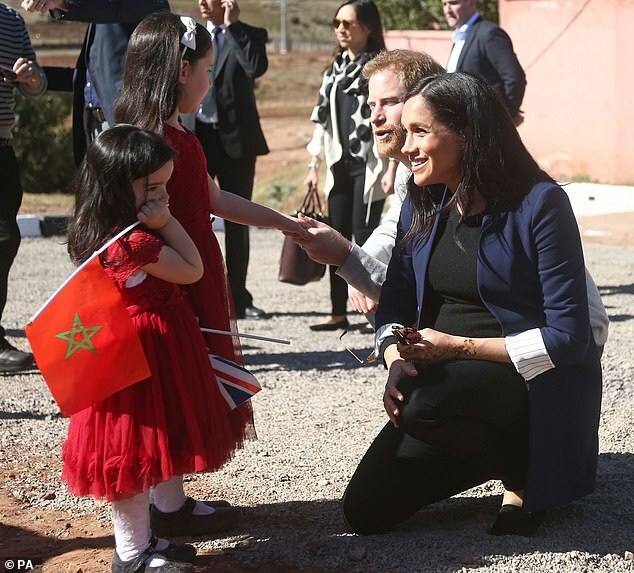 Speaking with staff at the Moroccan NGO Education For All (EFA) boarding house in Asni, which provides education for girls aged 12 to 18 from rural communities, one teacher congratulated Meghan, 37, on her pregnancy. 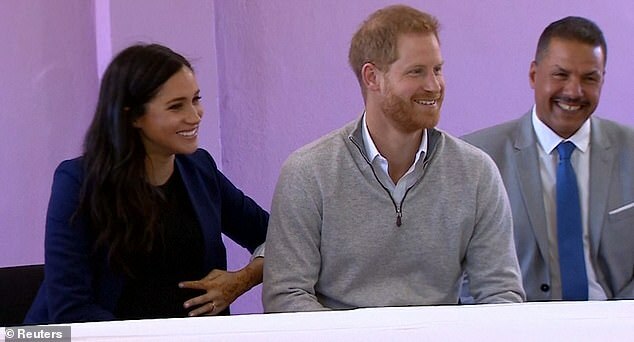 Sitting next to one another, the Duchess’ bump visible through her open £395.34 Alice and Olivia tailored long navy blazer, the Duke turned to his wife and pulled a face of mock shock. ‘Surprise!’ said the Duchess. ‘She’s pregnant! ?’ joked the Duke, before asking: “Is it mine? !”, with a grin on his face. Education for All started off with just eight girls in one house 10 years ago, and now houses 194 girls from surrounding rural communities in term time. 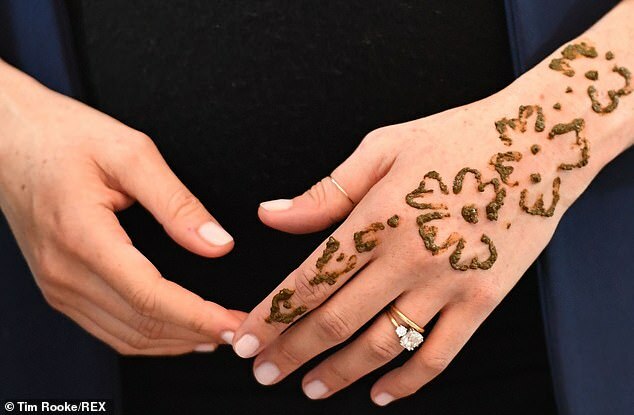 During the visit the duchess took part in a henna ceremony – an ancient custom that is thought to have its roots in North Africa – and had a design painted on her hand to celebrate her pregnancy. The traditional henna flower was applied by 17-year-old Samira, who has lived at EFA for six years. 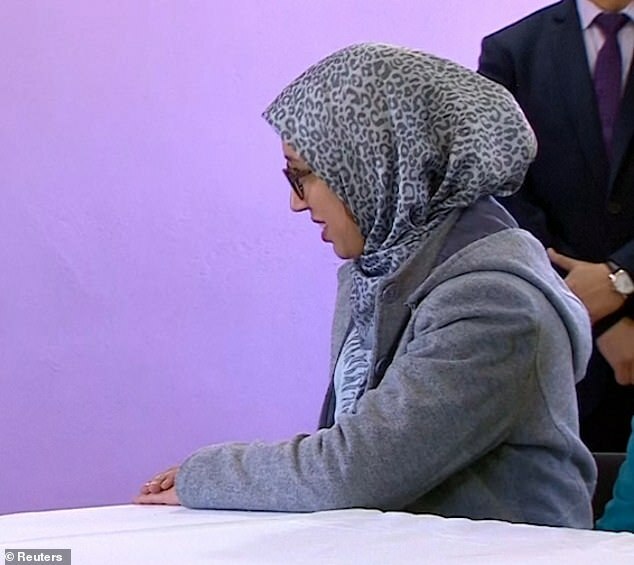 The couple arrived to Casablanca airport Saturday, where they were welcomed by the British Ambassador to Morocco and his wife before they inspected a Guard of Honour. The duke and duchess were two hours late for their welcoming ceremony following the knock-on effects of an earlier delay to their scheduled plane which flew from the UK. In darkness Harry inspected a sabre carrying guard of honour from the Auxiliary Forces, dressed in their pristine white uniforms and formed in two rows. The heavily pregnant duchess walked behind her husband as he looked over the troops who had been patiently waiting for over an hour. And despite spending a busy few days in New York for her luxury baby shower, which featured a string of A-list celebrities, Meghan looked relaxed and wore a striking red Valentino dress. 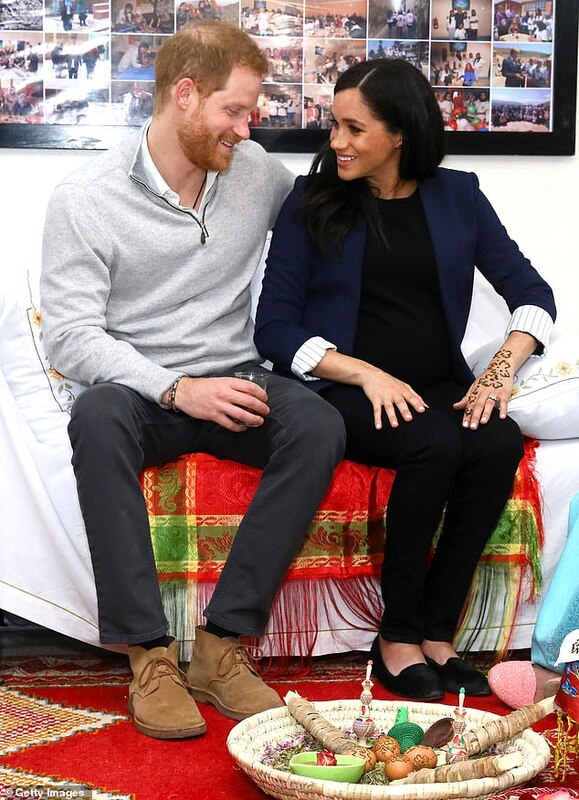 Monday, the third and final day of their tour, saw the couple meet children with special needs, before visiting a cooking demonstration, a traditional Moroccan arts and crafts display and attending a horse grooming session at an equestrian facility. 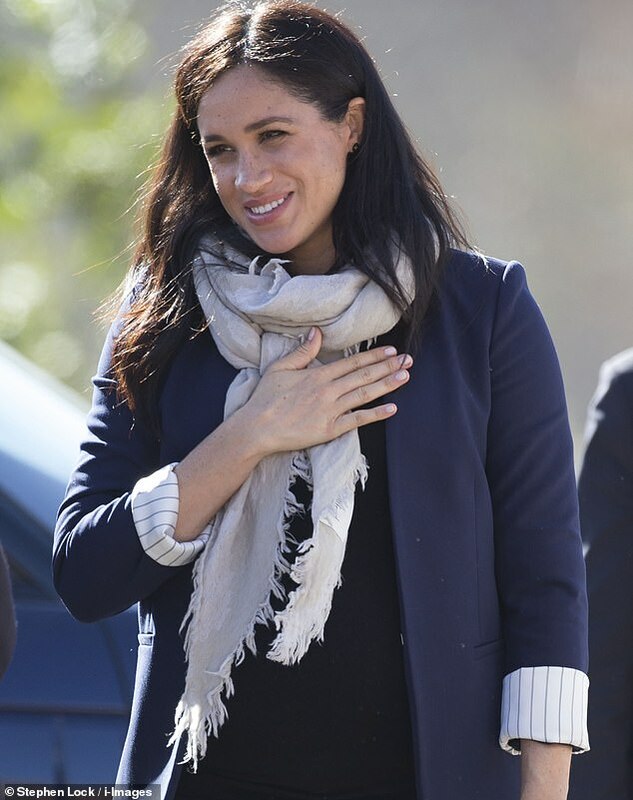 It is thought that Meghan is around 30 weeks pregnant, with most airlines allowing women to fly until the 37 week mark. A Kensington Palace spokeswoman said: ‘Their royal highnesses are very much looking forward to the visit and are grateful to their hosts and the British Embassy for arranging such an interesting programme. The couple began their visit to the capital Rabat by walking along a red carpet that led to Casablanca Airport’s royal suite. As they entered the building they were offered milk and dates a traditional welcome in Morocco. Pregnant Meghan appeared to pass but Harry could be seen nibbling on a date. A large motorcade of black limousines was waiting to take Meghan and Harry and their entourage of nine to meet Morocco’s Crown Prince Moulay Hassan. They were guests of Morocco’s King Mohammed VI at a royal residence.